Carly Coles and Sharon Rixner teach at Entheos Magna in Magna, UT. They were among the 2017 class of EL Education's Fund for Teachers (FFT) Fellows. Read more about FFT and what this long partnership has meant for EL Education here. Join an on-site dinosaur excavation and Paleo Training Course offered by Two Medicine Dinosaur Center in Bynum, MT, to incorporate real-life applications and experiences into a dinosaur and fossil based curriculum and spark student interest in science and scientific drawing. Our discovered T-Rex tooth at the Great Plains Dinosaur Museum. The tooth now belongs in their collection. My students will benefit from my experience because they now have access to talk to a Paleontologist and access to authentic fossil samples and geologic samples. I am better able to hold discussions about fossils and preservation of fossils and organic material in the classroom. I can also better discuss with them why geology is important and the different geologic processes. The students will be able to see the real artifacts from the field and have deep conversations about climate change. The greatest personal accomplishment of this fellowship was when I helped to uncover a well preserved fossil of a Tyrannosaurus Rex tooth at the dig site in Malta. The amazing part about this was that there has not been evidence of T-Rex in that area up until our discovery. 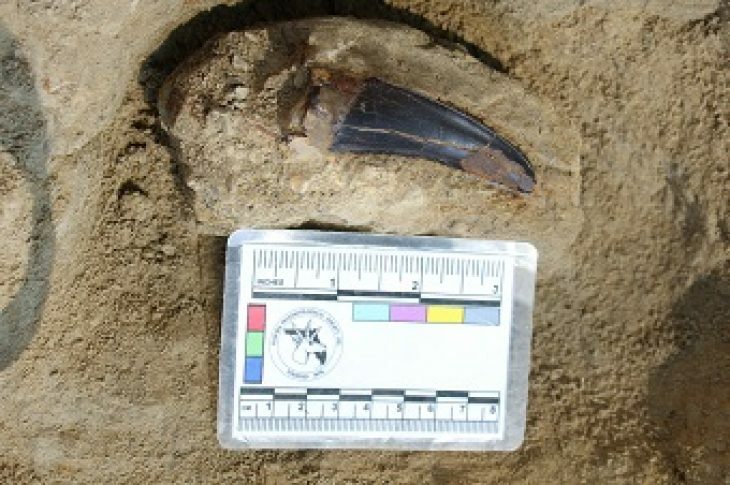 The tooth was also discovered right before a tail vertebra was discovered that had a large bite mark in it, making our dig site the scene of a T-Rex preying on the Edmontosaurus. Read much more about Carly’s experience here. Before attending Two Medicine Dinosaur center, I was unable to describe the pure joy of finding something millions of years old. I am able to explore with student the proper process of locating possibilities where fossils could be to the preservation of a specimen. During this adventure, I have gained additional information and information clarified regarding geological time periods. I am able to locate a dinosaur par from a model or sketch scale. Dinosaur Monument in Vernal, Utah is the location in which our students will fully put the new skills and knowledge they have learned to work. The students will have developed what to look for in research and how to distinguish between false information and a reliable source. Our school is a service learning school. Each grade, teacher or student chooses a service project to implement into the local community. Students will now have an additional area of community service by educating them with the preserving artifacts from the past and how important preservation is. Read much more about Sharon’s experience here.